1 Peel garlic. Rub a baking dish with garlic clove. 2 Rinse orange in hot water, wipe dry and cut into slices. 3 Rinse tomatoes and cut out stems. 4 Cut or halve tomatoes into thick slices, depending on size. 5 Trim scallions, rinse and cut into thin rings. Drain the capers. 6 Flatten olives with a knife. Mix all prepared ingredients with salt, pepper, balsamic vinegar and olive oil and pour into the baking dish. Rinse fish fillets, pat dry, season lightly with salt and pepper and place on the tomato mixture. Bake the oven rack in the preheated oven at 200°C (fan 180°C, gas mark 3) (approximately 400°F/convection 350°F) for 15-20 minutes. 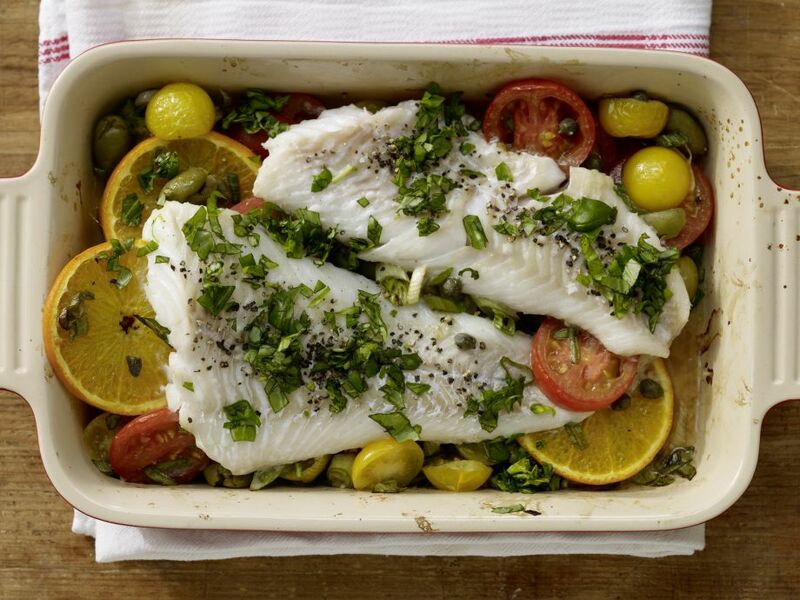 Rinse basil, shake dry, pluck leaves, coarsely chop and sprinkle over the fish before serving.